While the Wii U gets the remake treatment with The Wind Waker HD, the 3DS is getting the all-new The Legend of Zelda: A Link Between Worlds, which itself is set in the same world as Super NES classic A Link to the Past. Relatively little has been revealed to date, with Nintendo teasing small details and revealing returning mechanics such as a dark / light world. In today's Nintendo Direct presentation, Satoru Iwata outlined a shift in convention that could have a fairly substantial impact on the way the 3DS title is experienced. Whereas the series is known for introducing new items and abilities with fairly structured progress, with these options then utilised in increasingly challenging puzzles in relatively linear dungeon routes, this time around players will have greater freedom deciding the order of dungeons to play. With obtaining money clearly hugely important, you rent or buy key items — those typically obtained with progress in previous games — and essentially determine your own path; naturally we'd expect certain items and areas to have some form of linearity, potentially early and late in the game. 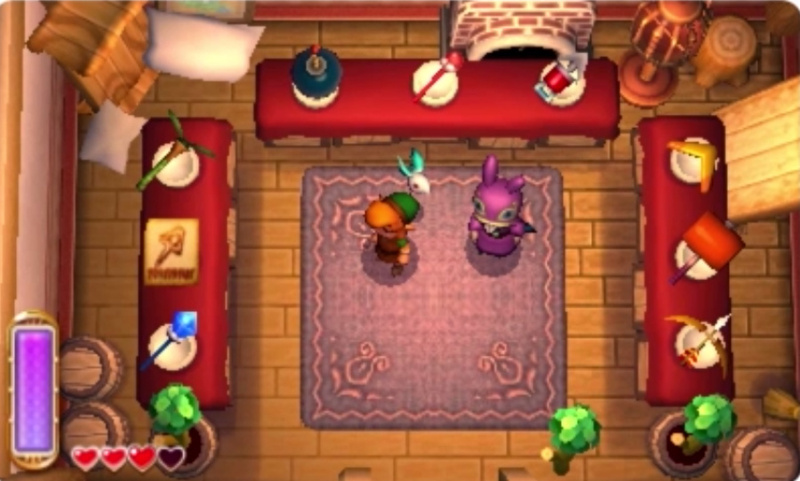 It was also clarified that the shop owner responsible for supplying most of these key items is Ravio, who despite visual similarities is not related in any way to Nabbit from New Super Mario Bros. U; that puts that speculation to bed. Some familiar characters, such as Dampe, will also appear in the game. This new entry in the Zelda franchise arrives on 22nd November in North America and Europe. What do you think of this new approach to obtaining important items? Man so much awesomeness today. I ain't gonna no money come december. I'm buying this on day one. That image of Zelda in this game was gorgeous. I think this is great. It adds a more freedom vibe to the experience almost like if it was an open world/sandbox game. @therick112 My thoughts exactly. It's going to be interesting to see how the final game turns out but, boy, I am hyped!! I actually like the graphics of this game more than WW HD. And the pace seems better too, this seems more like a game, WW seems more like a story. Of course that could just be the trailers. Actually, this is more like a throwback to the original title in a lot of ways. I recall doing some of the dungeons out of order in The Legend of Zelda back in the day when I was a kid. We even made it part of the way through Death Mountain before we had finished all of the other dungeons. I'm excited but I hope they don't screw up the formula the way they did with Paper Mario:Sticker Star. Experimentation is always risky, but I'm always happy to see Nintendo taking risks and playing with their established formulas a bit. It sounds like this is sort of testing the waters for changing the formula with Zelda Wii U. I hope this ends up being good, if only because the Zelda dungeon format has been a bit repetitive this past decade. High quality, but predictable. Experimenting for the new Wii U Zelda? I think so. As distasteful as it looks to see all the previously arduously begotten artifacts just sitting out on a table in a shop, I think the ability to suss out the best approach will be fun. It was possible in the original Zelda, but this goes further to suggest you experiment, sort of like Mega Man. I really like this idea. It takes me back to the original Zelda for NES days where you could buy the candle and keys in shops and find bombs from defeated enemies. I'm all for changing up the Zelda franchise. FYI, A witch named Irene appeared in the trailer. Odds are, she's based on Maple from Oracle of ages. @mrmario02: I was hoping she would be called Maple. Look at the bottom right corner. Well that's certainly the Majora's mask, and it will be on the 3DS. @Trikeboy I see what you did there. The horrible, obsessive nerd that I am, I've been playing the Zelda games in timeline order since Hyrule Historia was released. And yes, I've played the first four (Skyward Sword, Minish Cap, Four Swords and Ocarina) three times (one for each branch). Fortunately, I'm currently playing the last timeline branch (the downfall one) and I'm wrapping up the Oracle games, leaving me only Link's Awakening and the NES Zeldas. I'm so happy A Link Between Worlds falls in between Link's Awakening and the original NES Zelda so I can add it to my itinerary and not interrupt the proper timeline order. End nerd rant. I think they should take the difficulty from the Ages games and try to match that. (A Link to the Past was so easy if you had completed Links Awakening first as I had). I think I prefer Secret of Mana for that reason. Actually, in a non-sarcastic way, that is a hint - remember that the Pokémon Centers in Sinnoh have a Gold-and-Silver-colored Pokéball painted on the floor, a few months before HeartGold and SoulSilver were confirmed. In other words, Majora's Mask 3D isn't confirmed... but it's strongly hinted at. This Zelda makes me sad, as I now fear what the Zelda on Wii U might become. @AlexSora89 And in the japanese X&Y overview trailer, there is a cave with sapphires and emeralds. Gen 3 remakes! While the approach is different; in a way, the concept is a return to tradition. As we all know in the original, the dungeons could be completed in any order to a degree. I'm very interested and welcome the new approach as long as there's still a reason to loot chests and that backtracking to switch your inventory isn't obnoxious. Those are my main two concerns. I don't care what conventions they shake up; Wind Waker is the only Zelda game that I have ever enjoyed and that's the way it's going to stay. I hope everybody else enjoys this game, but the series is simply not for me. I just hope this feature adds depth of strategy without making the game easier. If we can just grind for rupees and rent/buy what we need to blast through the game I'll be pretty bummed. Very interesting. This and Super Mario 3D World really seem to be changing things up. Which is ironic considering how at first fans were saying they were more of the same. Aren't they also releasing the same day? I'm concerned about the difficulty curve now. If there isn't a clear order, will every dungeon be about the same difficulty or will the game employ some type of adaptive difficulty system? Looking good. Also, I'm really glad that the in-game character models still look like ALttP artwork come to life, instead of that new pastel colored Link they're using as the official artwork. Sounds good to me, if it doesn't work they can just ditch it for the next one in the series. @DestinyMan Eh, no, there isn't. You need to play most of the game in a linear order. Good thing I'm preordering this game tonight, then! @SomeBitTripFan maybe it'll be like Mega Man, where some are easier than others, depending on your skill? Christmas will be busy for me. Game-wise. Who knows. I doubt they would make this game as hard as a Mega Man game though. Hopefully it will be challenging. A non linear Zelda? Thank you!!!!!! Now have less tutorials and throw me into a dungeon when I start a new game and I'm good. "my nightmare" You want the bow well that can be purchased from the eshop as dlc for $2. While your there feel free to pick up another 10 pack of bombs for the sale price of $.99. I really don't know if this is good or bad! I just have to wait and see! By the way: Did you guys see that these evil green Zora's also have a leader? Some kind of queen! Choosing what order to play through the dungeons is always fun. Making the resolution of the dungeons in a non-lineal structure, while a little risky on one side, this could be quite an interesting approach in the series. If done well, could be definitely an improvement. Gotta give them some confidence and see how it turns out! Look... As long as each item has its own position in the item slot, I'll be okay. That is one mechanic that they USUALLY have in zelda games, but oot 3d lacked. it greatly annoyed me. I'm really liking the graphical art approach to this game, looks great! I'll always love every Zelda game and have fun playing, but really when you play one you know how to play them all so I love this change and it makes me wonder what's in store for Zelda games in the future! I've honestly never been into Zelda. I have beaten one though, a friend let me borrow Minish Cap and kinda helped walk me through the game when needed. But there's something about ALBW that really captures my interests in a way no other Zelda has or does. Its a combination of the art style, classic top-down perspective, and overall tone that just pulls me into it. Definately going to keep an eye on this. @aaronsullivan couldn't have put it better myself! I'm diggin it. I really don't get it. While I appreciate the effort to allow for out-of-order dungeon progression, I feel that making it stem from a store that has all of the integral tools takes away from the mystical element those items used to represent. Seems like a bit of a cop-out, to me. @SparkOfSpirit ...YES I agree less tutorials for the love of god. that's what instruction manuals are for if you need them. I don't remember tutorials in the first Legend of Zelda and i don't care how many buttons theyve added since then. people can figure it out ... my goodness! @jmularczyk Please don't say things like that... you're gonna give me nightmares. I hope I don't lose sleep tonight... no...no they wouldn't?... they... they couldn't?..... right?! Can't wait!!!! Grumble, Grumbling no more! @Pachterkid have you played phantom hourglass? This freedom is a try out for the freeroaming Wii U Zelda game, i'm sure of it. These changes are finally gonna in the direct where the first Zelda game left. P.S. Hehe, Princess Hilda... Seriously, did everyone else miss that? @jmularczyk It'd be with Play Coins, if anything. Microtransactions don't seem to be Nintendo's thing, thank goodness. Does anyone else see this as a major step backwards? I mean they give us an amazing version of Ocarina, the greatest Zelda of all time and now this crap? This is probably the same developer as the minish cap, which was pure crap. No more 2d nonsense, give us a triple a title already. Oh well, there is plenty of other stuff to play on 3ds, but as a huge Zelda gamer I wanted to state the obvious. Me, I see this a a slap in the face to Zelda fans and Miyamoto sticking his Mario stickers idea forcibly in a series that it doesn't belong. Sadly I might end up with a copy of this in my house since my son might get it, but much like sticker star as much of a fan I am to Zelda, I won't play this. They could have given us a truly quality game like OoT but they give us this. I've never been one to complain about the dungeon linearity of Zelda game. Hey, I even play the dungeons of the original Zelda in their standard order! But I have thought that the structure of the dungeons themselves need a bit of shaking up. This might do exactly that. Crap? This game looks great. Besides, ALttP is the best game in the series, and you can take that to the bank. Sounds interesting, I guess we'll have to see how this plays out!